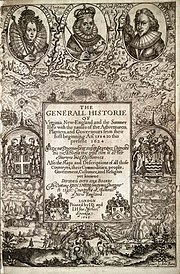 John Smith's The Generall Historie of Virginia, New-England, and the Summer Isles recounts early English attempts to settle New England. Ludovic Stewart, 2nd Duke of Lennox and 1st Duke of Richmond (29 September 1574 – 16 February 1624), was a Scottish nobleman and politician. He was the son of Esmé Stewart, 1st Duke of Lennox, and his wife, Catherine de Balsac. Ludovic was involved in the Plantation of Ulster in Ireland and the colonization of Maine in New England. Richmond's Island and Cape Richmond, as well as Richmond, Maine (formerly Fort Richmond), are named for him. Ludovic married, firstly, Sophia Ruthven, daughter of William Ruthven, 1st Earl of Gowrie, before June 1590. He married, secondly, Jean Campbell, great-granddaughter of James IV of Scotland, around August 1598. Lennox wrote in April 1605 to William Livingstone of Kilsyth, who managed some of his Scottish estates, that he wished to "rid me of her" and "be quit of her." In December 1610, after this marriage had ended and Jean had died, her brother Hugh Campbell of Loudon complained that the Duke had taken her fine things to England, leaving her "drowned in great debt" with only an old silver basin, three little cups, and their children. He married, thirdly, Frances Howard, daughter of Thomas Howard, 1st Viscount Howard of Bindon, on 16 June 1621. His illegitimate son, Sir John Stewart of Methven was married to Margaret Hamilton, daughter of Sir Claud Hamilton of Shawfield. This Claud was a son of Claud Hamilton, 1st Lord Paisley and a younger brother of James Hamilton, 1st Earl of Abercorn. Claud Hamilton also had a plantation in Ireland. On 14 November 1583, after the death of Esmé Stewart, Ludovic returned from France and was taken to meet James VI at Kinneil House. In December, James VI issued instructions for the education of Ludovic. The young Duke was to remain in the king's household under the care of Mr. Gilbert Moncreiff. Ten years later, the Duke and 15 friends subscribed to a frivolous legal document swearing to abstain from wearing gold and silver trimmings for a year, and defaulters were to pay for a banquet. In 1591 he was appointed to the post of Lord High Admiral of Scotland following the disgrace of Francis Stewart, Earl of Bothwell. Following his accession to the English throne in 1603, James (now James I of England) created him Lord Settrington and earl of Richmond (1613), and earl of Newcastle and duke of Richmond (1623), all these titles being in the Peerage of England. He acquired the licence to mint copper farthings. In 1623 he was granted the additional titles of Earl of Newcastle and Duke of Richmond. He died in 1624 without legitimate issue, aged 49, and was interred in Westminster Abbey, London. In the Plantation of Ulster, Ludovic was granted lands at Portlough in the Barony of Raphoe in County Donegal in 1608. Pynnar Survey of 1618 records the Duke of Lennox as being the chief undertaker for 2,000 acres in the Portlough area and as being represented locally by his agent Sir Aulant Aula, Knight. It is probable that Newtownstewart in County Tyrone, Ireland is also named after him. In the Muster Rolls of 1631 the 4th Duke of Lennox is described as being an undertaker of 4,000 acres. Ludovic was involved in the colonization of Maine in New England. Richmond Island and Cape Richmond, as well as Richmond, Maine (formerly Fort Richmond), are named after him. His English title of Duke of Richmond became extinct, but his Scottish title of Duke of Lennox passed to his brother, Esmé Stewart, 3rd Duke of Lennox. ^ a b One or more of the preceding sentences incorporates text from a publication now in the public domain: Chisholm, Hugh, ed. (1911). "Lennox" . Encyclopædia Britannica. 16 (11th ed.). Cambridge University Press. p. 420. ^ McNeill, Ronald John (1911). "Richmond, Earls and Dukes of" . In Chisholm, Hugh (ed.). Encyclopædia Britannica. 23 (11th ed.). Cambridge University Press. p. 306. Wikimedia Commons has media related to Ludovic Stewart, 2nd Duke of Lennox. This page was last edited on 26 March 2019, at 05:15 (UTC).